Contents: Roll, ice cream, salad, orange juice, and other items I can't identify. 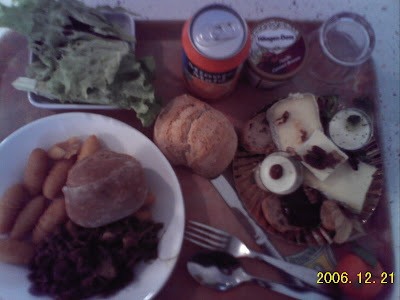 Those oval things on the plate look like Lutosa Pom`pins. Mashed potatoes molded into a conical shape and then fried. Crispy on the outside, soft on the inside. Haagen Dazs is an American brand, founded in New York City. It was just named that to make it sound Scandinavian. This lunch could be in any Western country, although it makes me wonder who would serve a plate of cookies on a lunch tray.